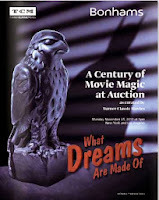 In Dashiell Hammett’s classic 1930 novel, The Maltese Falcon, all of the action focuses around running down a priceless statuette that (spoiler alert!) in the end, turns out be a valueless fake. 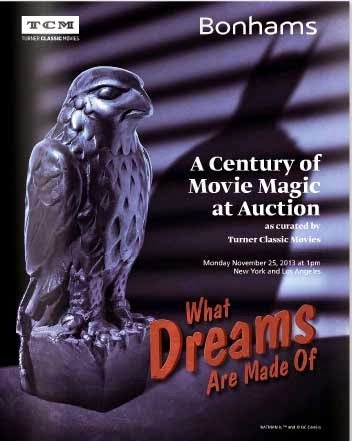 A prop falcon was commissioned for the 1941 film version of The Maltese Falcon starring Humphrey Bogart. Actually two of them. But the one used in the filming--complete with dents left from where Bogart dropped it-- sold at auction this week for more than double the original $1.5 million dollar estimate Bonhams had put on the bird. The movie memorabilia auction, conducted by Bonhams and curated by Turner Classic Movies, was also offering other items of significance in Hollywood. The negligee Vivien Leigh wore while playing Scarlett O’Hara in Gone With the Wind brought $56,250, while Francis Ford Coppola’s notated screenplay for The Godfather fetched $22,500, and the 1940 Buick Phaeton used in Casablanca sold for $487,650. You can view the auction catalogue online here.